NOTE: Unfinished game, released as the project is now cancelled. 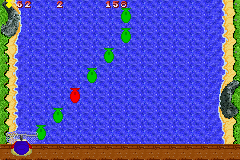 The story behind the game is that you have to catch 200 fish for a pirate in order to receive a reward. There are three types of fish which swim down the river, a Green fish which is worth one fish, a Yellow fish which is worth five and finally a Purple fish which is poisonous. 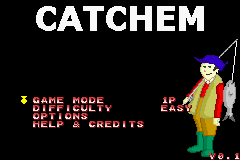 If you miss five green fish or yellow fish then the game ends, if you catch a red fish the game also ends as you have poisoned all your caught fish. The original Jak & Daxter game only had one level which was very short.. it was a quick minigame after all. So what I wanted to do is create my own game based on this and add more things to make it more playable. When I started writing my own version of the game it was originally in Mode 4 graphics as I didnt know alot about bitmap modes (see Never To Be Released: Shoot Out for reason why). Costis suggested that I should change over to a bitmap mode as it would suit the game much better, so I chose Mode 0. The first thing you will probably notice is that the view perspective between the original and my game are different, mine is a overhead view and Jak & Daxters is a 'over shoulder' view :) Its possible for me to make my game using the 'over shoulder' view using Mode 2 graphics but I dont have the knowledge at the moment to do this.. maybe in the future.